On March 1st at approximately 12:52 pm. a white male entered the US Bank at 6150 SE 14th Des Moines, Iowa and demanded money. An undisclosed amount of money was taken. The male is described as a white male, approximately 6’0 tall, gray hair, and unshaven. He was wearing a gray and black coat with a black collar with a black stocking hat. 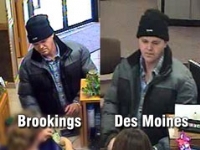 As you can see in the photos, this suspect closely resembles the suspect from the recent Brookings, SD bank robbery.